Trying to promote your business or brand can be tough! All day, everyday people are targeted and bombarded with ads. So its no surprise more and more brands are thinking out side the box with some fun, clever guerrilla marketing. Start getting noticed with your own guerrilla marketing campaign. One easy way to do this is with stickers or decals. 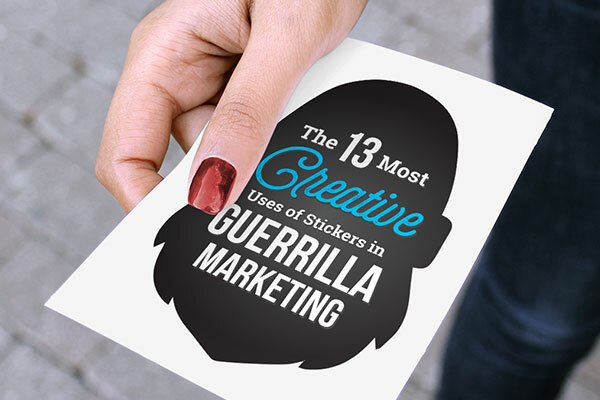 Guerrilla marketing is any unconventional, disruptive way of gaining attention for your brand. It's a great way for smaller businesses, with limited marketing budget, to get noticed and raise awareness. Many businesses have been incorporating stickers or decals into their guerrilla marketing campaigns. The "sticky" nature of stickers allows them to adhere to many surfaces, essentially turning any location your brand's sticker is stuck into an advertisement for you. Stickers also naturally viral. People just seem to love stickers and will collect them if you are giving them away. In addition to all this, custom stickers have a fairly low cost to manufacture, especially if they are being mass produced, which gives them an astounding ROI, compared to traditional marketing tactics. One sticker, stuck up in a public place, could receive potentially hundreds of impressions per day for however long it is stuck in place. The cost of that one sticker may have been mere cents. Follow in the footsteps of these major brands and get creative with your next guerilla marketing campaign. You don't have to have a big budget to make a big impact, just some custom stickers or decals and a good idea.